Happy Valentine’s Day from Lola and Baby Girl! 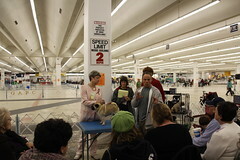 After the Greater Atlanta Pug Club, Barry Clothier presented “Grooming the Pug for Show.” Barry is a professional handler of some of the top winning pugs. The proceeds from this event will go to benefit Pug Dog Encephalitis (PDE) research. I got a couple of photos, but it was a little difficult to get a good shot. Everyone was eagerly crowded around the table to see Barry work his magic on pugs. Here are some of the top tips that I took away (I don’t have a show pug, but I felt this information was pertinent to anyone with a pug. The first thing that he said was FOOD! He feeds RAW. 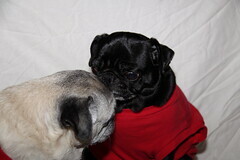 He said that what you feed your pug will contribute to their health and coat. Now he did say that he wasn’t there to tell someone what to feed, if what you are using now is working then that’s fine, but he does feed RAW 2 x day and adds green beans, salmon oil, and supplements. He said never use a stripper on your pug’s coat (Furminator). I probably turned about 8 shades of guilty. He said that a stripper breaks the hairs and causes them to split. You’ll end up with a pug with a Terrier coat. He brushes his pugs 5 min a day. Brushing will remove the hairs that naturally want to come out where as stripping doesn’t actually remove the excess hairs. Brushing them also distributes the natural oils into their coats. He actually spent almost 2 hrs on the grooming, most of which was very show related, but quiet interesting. 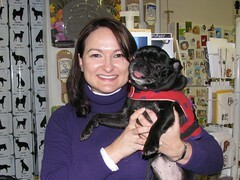 *Barry was assisted by Vallarie Cuttie with Peachtree Pugs. Today, the Greater Atlanta Pug Club had their 28th Specialty Show. The show got started with sweepstakes. The fun thing about sweeps is that it seems like the puppies always steal the show! There were some adorable up and coming pugs that I am sure we will see more of in the future. 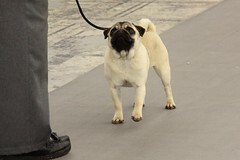 After sweeps were the regular classes which brought out some of the best pugs. No literally, I was star struck by the multiple Champion pugs represented at today’s event. Photography wise, this was my first big event of 2010 and I started off the year with a new tripod. You are currently browsing the papaspugs.com Blog blog archives for February, 2010.